“A grove of giant redwoods or sequoias should be kept just as we keep a great and beautiful cathedral,” by Theodore Roosevelt. 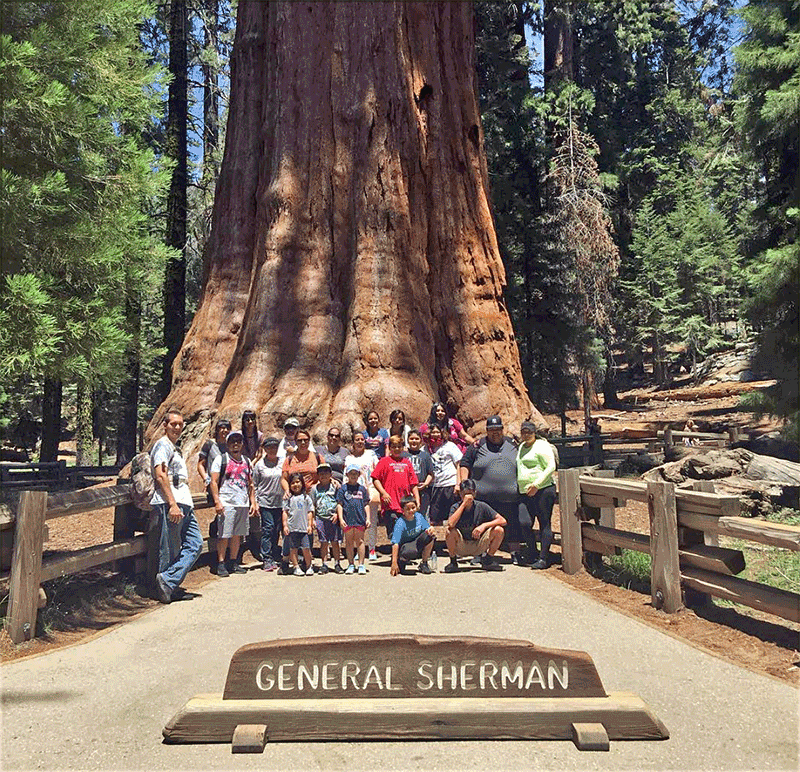 These words have never resounded so true and pure in our hearts than the day that our family and youth came face to face with General Sherman, a giant sequoia that is considered to be the largest tree in the world at Sequoia National Park in California. On July 15-16, 2017, Latino Conservation Week (external link) was in full swing sponsored by Hispanic Access Foundation, and we had the privilege to participate in visiting this beautiful national park with a group of city youth, young adults and youth leaders ranging from different backgrounds and ages from Los Angeles. On Saturday and Sunday, with the help of Save the Redwoods League and the National Park Service we were taught the importance of conservation and protection of these beautiful lands. One of our youth participants was quoted saying, “Walking among these giant sequoia trees, has been a life changing experience, once in a lifetime. I can’t even fathom the thought of this place being destroyed by human hands. I want to do my part to help protect and conserve these national parks for my own health and for the health of my future children.”- Kimberly Marquez. On Saturday, July 15, the National Parks Service staff, including firefighters and law enforcement rangers taught us about the value of their jobs protecting Sequoia National Park and what steps they took to become active members from internships to full-time employment. We learned and experienced how giant sequoia trees grow from such a tiny little seed, much smaller than a sunflower seed. We visited many famous trees like General Sherman and the Sentinel. We were able to get up and close to one of the sequoias to be able to measure and monitor its growth and health of the tree, truly a once in a lifetime opportunity — our young people were in awe. We had the opportunity to explore our surroundings and learn about the animals in the area and the local plants that call this beautiful place home. Among the many wonderful things we experienced both days, one of the great things that we noticed was that every path and trail was wheel chair accessible. Yes, you heard that right, wheel chair accessible hiking trails. How wonderful it is that the National Park Services thought of handicapped people so that they too get to experience close up the majesty of our natural lands. Nature is one of God’s beautiful creations. Through nature, God is able to teach us, speak to us, and provide for us. For this reason, we can find in scripture that we humans are called to protect all which is of He has created. As a Pastor, Nature is very important to us as we use it as church outings, baptisms and many wonderful teaching inspirational sermons. We as Latinos we know the importance of protecting the land that provides for us and feeds us as well as help us live a life with health and clean air. We also learned that sequoia is like the lungs of California purifying the air that we breathe. Which is another great reason why we love this place so much. We would like to thank Save the Redwoods League, Hispanic Access Foundation, Latino Conservation Week, National Park Service, Sequoia National Parks, and Por la Creacion for making this trip for us possible. On behalf of my family and youth participants, we thank you so much, God bless. 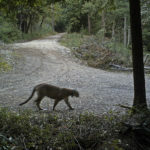 A few years ago, Justine Smith, a researcher with the Santa Cruz Puma Project, observed an interesting pattern; in human-populated areas, mountain lions killed more prey but spent less time feeding. Researchers weren’t sure why, but they suspected it had to do with lions’ fear of people. The fresh, salty air hung heavy as I wound my way south along the coastal highway with expansive vistas of the Pacific Ocean stretching across and meeting the blue sky infinitely far away. I’m on my way to see the giants I’d dreamed about since I was a kid. Could it be true? Entire cars driving through a tunnel in a tree trunk? No way.